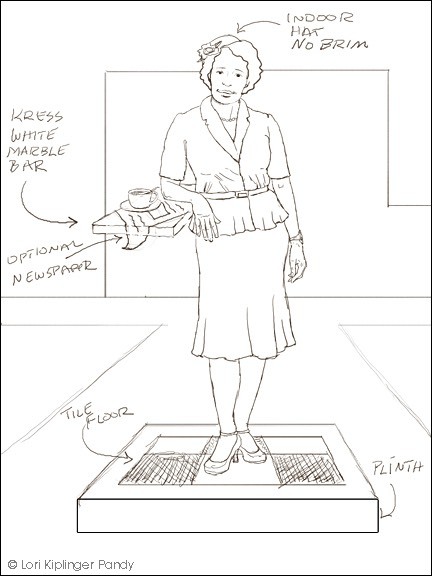 One of the ideas that I wanted to explore in creating this sculpture was the use of the Kress Counter. Fannie Mae was an astute business woman who made it a habit to read the local Colorado Springs Gazette and to keep her ear to the ground for news and opportunities. One morning over coffee and the paper she saw that the Kress five and dime store was remodeling and was selling off their furnishings. Fannie Mae saw an opportunity to get some great deals for her own Duncan Dinner and was determined to purchase the white marble counter and stools, along with other restaurant equipment. Very symbolic…. I love symbolism. I was the geek in English class that loved to see how many symbols and examples of foreshadowing that I could find in any of the books that we were reading and often employ symbolism in my own art. You see, while the school system in Colorado Springs was fully integrated the actual city, like the rest of the country, most certainly wasn’t. Blacks were not allowed to go into the Kress five and dime, sit at the counter and get a bite to eat. Even before the sit-ins in the South to protest inequality and services for blacks, Fannie Mae Duncan realized a way to over come that barrier - she bought the very counter that she, her family and her friends were not allowed to use. She was determined to make that counter her own and to make every person who walked into her establishment welcome to sit on those bar stools and be served with respect and a smile. That part of her story was very poignant to me and I chose to try to use that in a sketch idea for the sculpture. I love the symbolism that she smartly purchased something that really represented such gross inequity and then vanquished that essence by making it available to all. Actually owning that forbidden counter and stools must have felt very good indeed. I like the concept and made some notes to explore on my sketches. I need to consult with my patina artist regarding the idea of making the checkerboard tile ‘lilypad’ base. There are ways to show lights and darks in the patina with chemicals and also with the use of texture and may or may not really translate well in the bronze but is an idea worth exploring. Additionally I have chosen to have the marble bar truncated (cut off) and not have the heavy wood base that would normally be supporting the bar top. The base would be a huge waste of expensive and very heavy bronze and would obscure a good portion of the figure from the one side, therefore it doesn’t add to the visual experience. As an artist, I take creative license in order to make the work better so I am noodling on how to make the floating bar counter look natural. In a single sketch it is hard to determine if the idea will translate into 3 dimensional bronze and I’m looking forward to playing with the concept more in the clay maquette as I find it very intriguing. In this slightly revised sketch I have added a bit of the newspaper along with the coffee cup. Here is another variation of this same pose, this time with her hand perched on her hip. This opens up the pose and the body language a bit more. I could have the counter empty or with any variety of items but the coffee cup is rather universal and most people would feel a casual sense of community sharing a cup of coffee and sets the stage along with the tile floor. 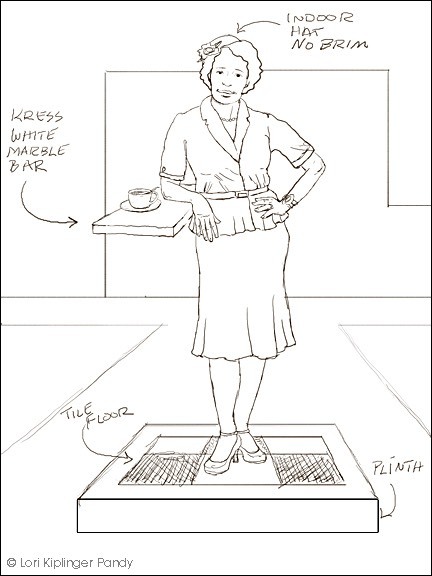 This would make the setting the Diner as opposed to the Cotton Club but also removes any references to alcohol which may not be as desirable for a public art sculpture. Since this is an indoor setting I would choose to have no hat or a day hat with no brim, which looks more natural than a broad brimmed hat which beckons more for outdoor wear.